Fisheries and aquaculture play a vital but often poorly acknowledged role in global food security. Together, fisheries and aquaculture provide 4.3 billion people with ~15% of their average per capita intake of animal protein. By 2050, an additional 75 million tonnes of fish will be needed to help feed more than 9 billion people. The recent revolution in aquaculture, and continued improvements to management of capture fisheries, have potential to provide the additional fish required. However, warming of the world’s ocean could disrupt these important initiatives. Ocean warming will result in ‘winners’ and ‘losers. Changes in distributions of fish stocks as species seek their optimal temperatures, and as the habitats on which they depend are altered by higher water temperatures, will result in decreases in fisheries production in some countries and increases in others. Similarly, the prime locations for mariculture are expected to be altered by ocean warming, resulting in changes in yield patterns among countries. The effects of ocean warming on the contributions of marine fisheries and mariculture to food security should not be considered in isolation from those of other drivers. Rapid population growth, fish exports and poor fisheries management also affect availability of fish in many developing countries. These drivers often create a gap between how much fish is needed for good nutrition and local fish harvests. 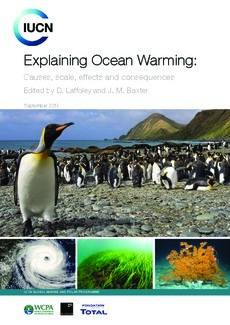 The main effects of ocean warming are to alter (increase or decrease) the gap. Changes to the gap due to ocean warming are expected to be greatest in tropical and subtropical countries. Adaptations are needed to minimize, and to fill, the gap. Adaptations to minimize the gap include reducing the impact of local stressors on fish habitats through improved integrated coastal management and marine spatial planning; keeping production of fisheries within sustainable bounds using the most appropriate management measures for the national context and a climate-informed ecosystem approach; and improving supply chains. The most important adaptation for filling the gap will be the expansion of environmentally sustainable mariculture (and freshwater aquaculture). However, for some developing countries, the most practical adaptations for filling the gap will be re-allocating some of the catch of large and small pelagic fish taken by industrial fleets to small- scale fishers, and/or arranging for industrial fleets to land more of their catch in local ports.